88 pages, 5.5" x 8.5"
M.D. Creekmore is one of America's foremost experts on survival, emergency preparedness, and self-reliance. He has dedicated his life to learning the skills needed to stay alive in an increasingly dangerous world. Since its inception in 2007, his blog (www.thesurvivalistblog.net ) has grown into one of the most popular preparedness sites on the Web. 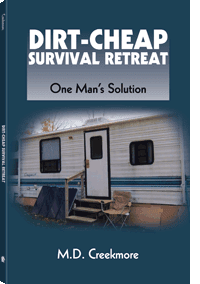 A few years ago, he got sick of being another rat in the rat race, so he bought two acres of land off the grid for $2,000 and parked a 26-foot travel trailer on it—this is now his full-time home and survival retreat. He is a black belt in Shotokan karate, gunsmith, survivalist, homesteader, and all-around nice guy.